OSOYOOS, BRITISH COLUMBIA — Desert settings have a reputation for romance. A combination of warmth, unique sunsets, and breathtaking landscapes has inspired generations of poets, photographers, and dreamers to entice others to follow their paths. Canada’s largest sub-Arctic desert region is no different. 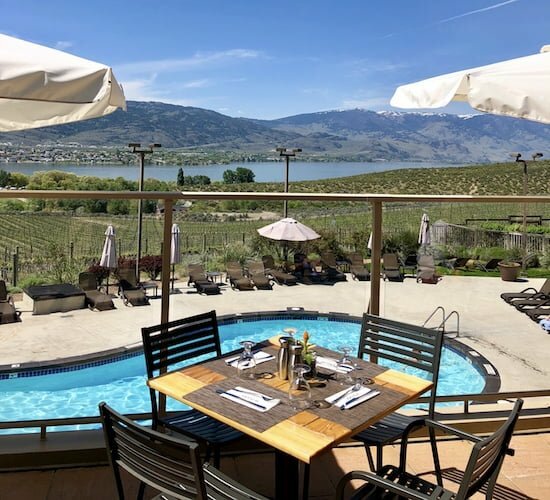 Romantics flock to Osoyoos, a city of 5,000 people located in British Columbia’s Okanagan Valley, for its relaxing escapes, wine tours, and luxury resorts. Unlike most other arid parts of North America, Osoyoos is in the heart of an agricultural hotbed. The area known as the South Okanagan produces the majority of BC’s wine-growing grapes and also has working farms and a thriving tourism industry that has made romantic appeal part of the attraction. At Spirit Ridge, a high-end resort that is the first property in Canada to join the Unbound Collection by Hyatt, guests have the chance to indulge in the best of the region’s offerings. Solterra Desert Spa provides a variety of treatments in an intimate setting with Indigenous decor — a nod to the Osoyoos Indian Band, whose traditional territory includes nearly all of the Okanagan Valley. The spa’s services include a Couples Vitality Massage as well as a full range of Bridal Services for those guests who have succeeded in levelling up their romance. Following an expertly done treatment, you can relax quietly with a beverage, feeling satisfied in the moment, or laze in the sun on the spa’s patio. You can also catch rays at Spirit Ridge’s gorgeous outdoor pool, which overlooks Lake Osoyoos and the Monashee Mountain range. It features a view of the vineyards that grow some of the grapes used in neighbouring NK’Mip Cellars’ award-winning wines. 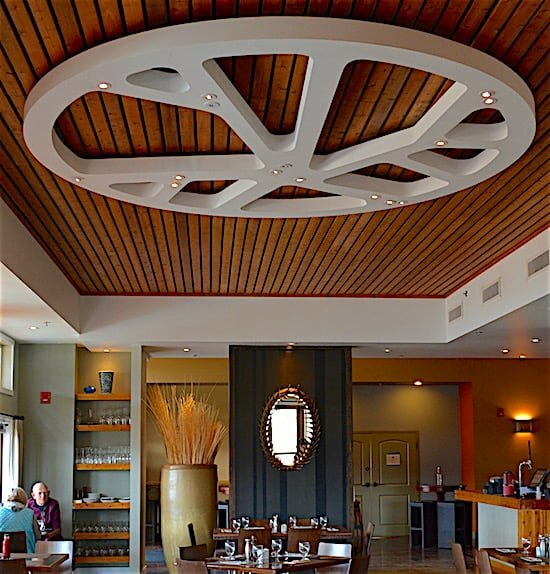 Those wines — along with a selection of others from wineries in the area — can be enjoyed al fresco with cuisine from Mica, Spirit Ridge’s fine-dining restaurant whose menu spotlights local flavours in recognizable dishes (try the mushroom ravioli that’s served with shaved black truffle on top). Take a bottle of wine back to your room, where you’ll appreciate Spirit Ridge’s incredibly spacious accommodations that include full kitchens and upscale appointments throughout. Many rooms showcase the scenery, where the Okanagan sunsets can be appreciated on decks that entice you to linger, thanks to outdoor temperatures in spring that can climb above 30 Celsius degrees (86 Fahrenheit). With Spirit Ridge as the base for your stay, couples can explore the area, hiking nature trails, including those at the NK’Mip Desert Cultural Centre, located a few steps from the hotel. 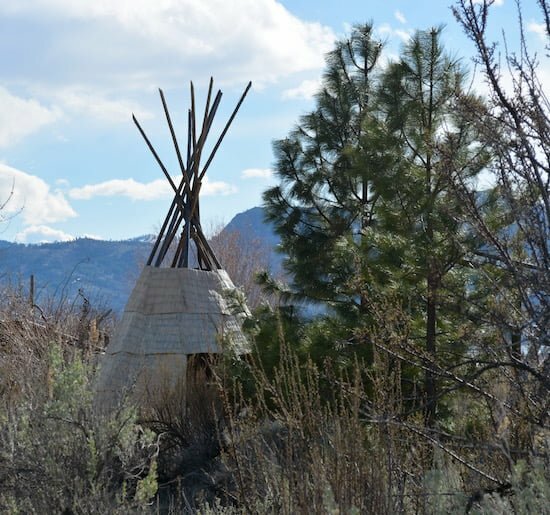 The cultural centre’s exterior highlights include a 20-minute walk to a replica teepee village where visitors can learn about the Osoyoos Indian Band’s practices and history. Farther afield are hikes through grassland thick with sage, Mariposa lily, bitterroot and other plants that are important to this delicate ecosystem. Grassland comprises less than 1 per cent of British Columbia’s land area, and much of that terrain can be found in the South Okanagan. 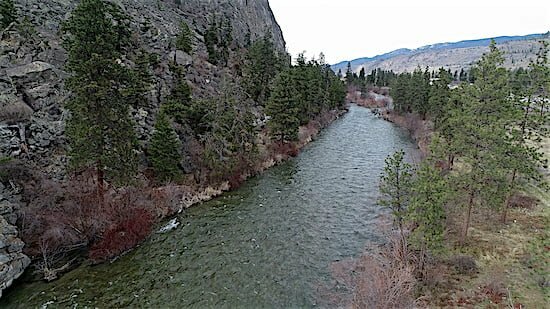 The most dramatic hike in the region may well be the one that takes you to the summit of nʕaylintn (prononuced nigh-lin-tin in the nsyilxcən language of the Okanagan Nation). Climbing to an elevation of 673 metres (2,208 feet), the cliff rises above the South Okanagan, gracing hikers with a superb panoramic view of the vineyards, mountains, and distinctive land that define the region. Like so much else in the South Okanagan, the outdoor experience of hiking to a peak with nature in bloom fills you with appreciation for all that is in front of you — and next to you. That’s one reason why couples seeking an ideal destination to kindle their romance are sure to warm up to the idea of a visit to the South Okanagan. NK’Mip Cellars Continues to Blossom — One of Canada’s leading wineries, NK’Mip Cellars is building on the reputation it has built for producing award-winning wines and providing outstanding tasting experiences. Read more. Destiny Matches Winemakers and the South Okanagan — Immigrants from India, farmers devoted to sustainability, and Indigenous community members have turned the grape-growing regions of Oliver and Osoyoos into global success stories. Read more. Osoyoos Indian Band Cultivates Success — The grape-growing land of the South Okanagan resides in the traditional territory of the Osoyoos Indian Band (OIB), which is a community of about 540 members within the Okanagan Nation, and their agricultural practices and spirituality tied to the land have been important in cultivating the crops that have led to such success for many in the region. Read more. This article is the fifth of an expanded content series focusing on travel to Osoyoos and the South Okanagan. It was created in partnership with Destination BC, the Osoyoos Indian Band, Arterra Wines Canada, Spirit Ridge Resort – Unbound Collection by Hyatt, Destination Osoyoos, and the Oliver-Osoyoos Wine Association.